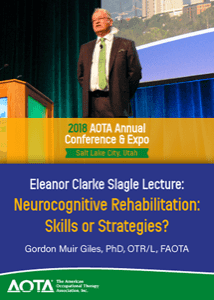 2018 Eleanor Clarke Slagle Lecture: Neurocognitive Rehabilitation: Skills or Strategies? It is an exciting time to be an occupational therapist! The wider healthcare community is embracing the occupational therapy concept of functional cognition, the notion that cognition can only truly be understood in the context of activity. Evidence supports an occupational performance-based approach to both assessment and intervention for clients at all levels of severity of neurological injury. The presentation begins and ends with personal reflections on life as an occupational therapist, and a real clinical example is used to bring these concepts into vivid focus. New evidence underlines occupational therapists’ unique role in skill development in clients with severe traumatic brain injury. Even in an environment of rapid innovation, occupational therapists need to recognize that what really matters is assisting clients to find a way to carry out the commonplace activities that have meaning for them. This is both the art and science of occupational therapy, and it will never be mechanized or superseded by technological innovation.